Have you heard of Claire Saffitz? Up until today, I didn't know her name, but I knew her reputation. Around our office, my colleagues would tell me constantly that I should watch the 'gourmet chef who makes re-makes every day foods and snacks by herself.' I'd heard the stories of her attempts at making Cheetos and Ferrero Rocher and how fun and humorous she is to watch. 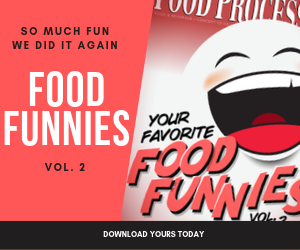 From her improvised equipment to her formulation flops, she tackles foods like instant ramen, gushers, sandwich cookies, and more during her 15-20 minute segments that you can find on Bon Appetit's video channel or on YouTube. The curiosity finally got the better of me, so I plugged in my trusty earbuds and sat down to nosh on what she was dishing up. Before I watched some of the videos, I couldn't help but wonder if the manufacturers of these snacks and goodies were worried about her unveiling some sort of well-kept trade secrets. And then I watched the videos. Her attempt to cut the perfect notches into her Cheez-It attempts (which you can see in the video below) confirmed for me that companies like General Mills and Mars didn't have a lot to worry about. She wasn't breaking the code on Coca-Cola's secret recipe nor was she trying to bring shame down on a particular type of ingredient. If you're looking for a fun mental escape that still has workplace relevance (i.e., you want to watch videos while on the job) take a look at the video below and head over to their channel to see what she's cooking up next.